Threads of Time by Julie Hendricksen is a classically-designed shirting and calico collection with the clean lines and even color that we have long adored from Julie. Thirty-three saturated blue, green, pink and brown patterns are accompanied by twelve natural-ground shirting patterns. Slightly larger in scale than your typical reproduction motifs, this collection has a fresh appeal. 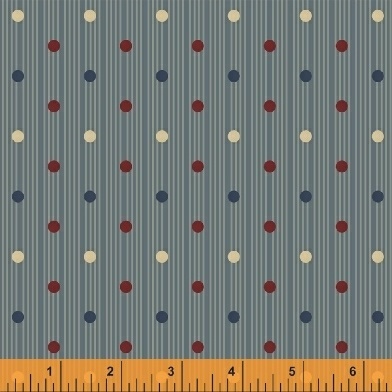 Threads of Time is part of a 9-month Block of the Month program through Windham Fabrics. The unique quilt designed by Julie Hendricksen is dominated by flying geese broken up by larger traditional blocks. The effect is both reproduction and fabulously current at the same time. The quilt measures 72 x 88 inches. Shop kits will be available in May 2014 for shops participating in the BOM.